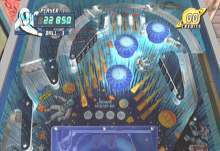 Pinball Hall of Fame for the PSP is an outstanding simulator that brings almost a dozen classic flipper tables to life in vibrant fashion. The tables are recreated in authentic fashion with all the bumpers, lights, and sound effects you've come to expect, with responsive gameplay that feels right as well. Authentic ball physics and reactions make the gameplay feel right, with excellent controls. Multiple camera angles and either vertical or horizontal presentation add to the game's excellence, as do the numerous unlockable tables and tournament challenges. Pinball Hall of Fame's table selection is superb with a varied, interesting selection ranging from the 30's to today. This excellent pinball simulator offers plenty of challenge in short bursts that makes for an almost ideal portable gaming experience. Featuring nearly a dozen classic Gottlieb tables, Pinball Hall of Fame is a mini-version of the classic compilation released about a year ago on the consoles. Despite its small size, the title still packs a remarkable level of detail, with the robust graphics faithfully recreating the look and feel of classic pinball. 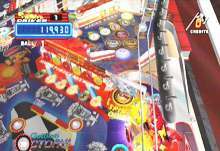 As you begin the game, you enter a virtual arcade filled with machines, which you can navigate through using the d-pad. Once you've selected your machine, you can change your options including viewing angle, number of balls in each credit, tilt sensitivity, table or music volume and you can turn the glass reflection on and off. The layout of each table includes a number of flippers, assorted targets, bumpers, and ramps depending on design, elevated play sections plus loops that move the ball into another area of the board. Players will find their score displayed on the upper right, along with the number of balls remaining and their accumulated credits. In the horizontal position, players release the ball using the analog stick and control the flippers using the shift buttons on top of the console, the vertical position again uses the analog controller as the plunger, but shifts the flippers to either the d-pad or the face buttons on the right. The game's interface is remarkably easy to understand and quite intuitive. This ease of use allows you to concentrate on the game itself and makes this a joy to play. Pinball Hall of Fame includes several modes of play, including a free-practice mode where you can play the machines at your leisure, a challenge mode where you have to beat the high score in a series of machines, and a tournament mode that lets you compete with other players. In addition, players with wi-fi connections can share the game's tables and compete against their friends wirelessly, even if they don't have the disc themselves. The game also includes extensive histories of each game, with flyers and background, plus there's an in-depth tutorial that shows you the layout of each table as well. However, what's most impressive about the game is how faithfully it captures the nuance and strategy of actual pinball tables. The ball physics in the game are excellent with the balls recoiling, jumping, and bouncing off the bumpers and targets in realistic fashion. Using the flippers is intuitive since they react and work just like they would on a real table - you can use some strategy in aiming your shots and the physics engine is sophisticated enough to allow you to flip well before a ball hits the bottom of the flipper so you can aim your shots effectively. Each table in the game has a distinct strategy and layout that challenges you to master its goals and achievements, which makes for an addictive, exciting gameplay experience that offers plenty of variety. While aiming for a high score is the primary objective, players can also earn credits by completing table goals, such as knocking down all the targets or hitting the right trap. Beating these goals can also set some of the tables from credit play to free play, which means unlimited playtime. The tables themselves offer a decent cross-section of eras and styles, giving you a good selection of different play mechanics and approaches. Obviously, the early tables from the 50's and 60's like Ace High, Central Park and Big Shot have simpler layouts with straightforward placement of bumpers and targets. While they lack the bells and whistles of later tables, there's a lot to be said for their simplicity, which makes these some of the most addictive tables in the game. 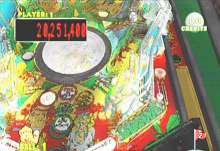 However, some of the later tables like Genie and El Dorado also offer solid gameplay that stays true to pinball tradition for the most part, with a few added twists. Some of the most elaborate machines like Black Hole and Teed Off are interesting and present their own unique challenges, with multiple targets, elaborate systems of loops and ramps, and for many, multi-ball play. 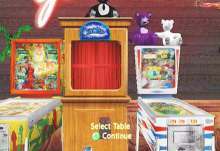 There are also a couple of odd tables stand out from the rest by offering a unique spin on pinball. Goin' Nuts is an interesting game where you are gived multiple balls at the outset, with several hard targets to hit which increase the timer. When you lose all the extra balls except the last one, the timer begins ticking down, which makes for an interesting challenge that can be occasionally frustrating. The earliest game on the pack is from the 1930's and is called Play-Boy. Your objective is to release ten balls onto the playing field with each hole representing different playing cards and make hands in several variations including Poker and Blackjack. This was banned for encouraging gambling back then and is an odd game more reminiscent of Pachinko than modern pinball. Pinball Hall of Fame also includes a more recent variation with the bowling game Strikes and Spares offering a combination of pinball and those novelty bowling games that used to populate arcades. It's more a matter of timing than skill, but this one is an interesting diversion nonetheless. In addition, the game includes several novelty machines such as the infamous Love Tester and a mechanical seer that can be played and unlocked once you've earned enough credits. From a visual standpoint, Pinball Hall of Fame is outstanding with each table recreated faithfully down to the smallest detail. The rich backdrops and artworks are vibrantly rendered in authentic fashion making the game look as good as it plays. Players can select from several different camera angles ranging from a standard horizontal close-up where the camera zooms in on the playfield to follow the ball to larger views where the entire table is seen. The drawback with these wide-angle views is that it makes the ball difficult to see and follow, while in the close-up mode, it can sometimes be hard to aim your shots if you've selected a camera that's too close. Most players should be able to find a happy medium somewhere in the middle. 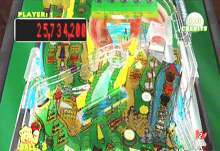 These problems are even less evident if you switch to a vertical view, which is impressive since it better fits the rectangular proportions of most pinball machines, allowing for greater detail and perspective. The sound effects are also quite authentic with each table's buzzers and sirens accurately recreated, along with the traditional mechanical noise that the flippers make. Unfortunately, the developers have also included ambient noise from the arcade machines, which gets annoying quickly and can't be turned off which is annoying. However, it's only a minor flaw in an otherwise superb package. Overall, Pinball Hall of Fame is a superb collection of arcade games that accurately reproduces the look and feel of these classic machines. While most of the tables in the title are several decades old, they're still quite enjoyable today, making this much more than a nostalgia title or museum piece. Played in either extended sessions or short bursts, the challenging tables and numerous extras make this an addictive, entertaining title that's perfect for on-the-go play.